Beartrap Bluff and Mt. Minerva Hoyt were added to the HPS list back in 2014. The latter was named after an early American activist who worked in the 1930s to preserve California desert areas, including Joshua Tree National Monument in 1936. The former is named after a mundane campsite along a creek of the same name in the Sespe Wilderness in Ventura County, not nearly so deserving. Peter Doggett had worked to get Beartrap Bluff, sporting less than 150ft of prominence, added to the HPS list as he had done on a number of previous list expansion efforts. Nice guy, I'm sure, but I wasn't all that thrilled with his previous summits of Wild View Peak and Pine Mtn Ridge, and kinda left Beartrap as a back-burner thing. The three of us had talked about it a few times while hiking in Red Rocks recently and Sunday seemed as good a time as any to give it a shot. It turned out to be an enjoyable outing, about 12mi all told, in a leisurely effort just short of six hours. 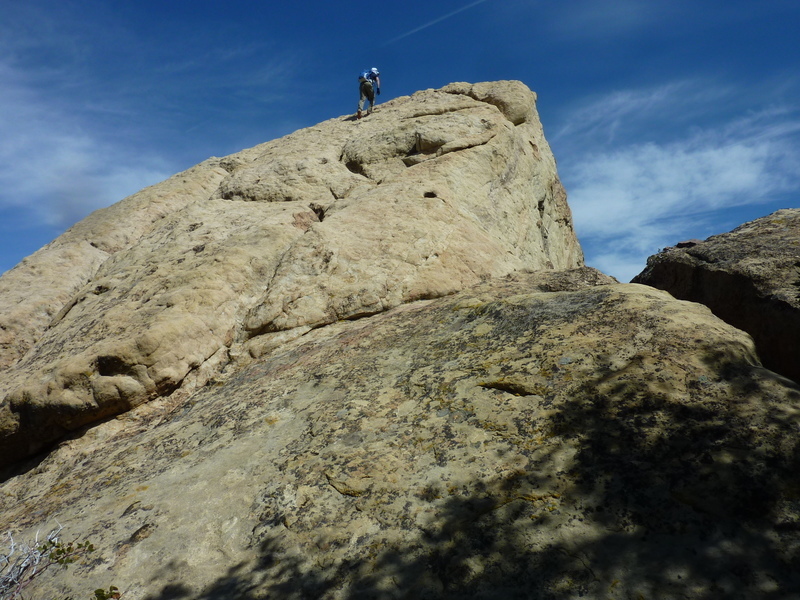 The summit block was interesting as was the cross-country to reach it, and this was the first time any of us had been on this particular trail in the Sespe backcountry. We met up at the Flying J Travel Center in Frasier Park off Interstate 5 at 7:30a. We left my van there and carpooled in Tom's new Jeep Rubicon to the trailhead almost an hour's drive away, only a few miles east of Lockwood Valley Rd's junction with SR33. Seeing almost no one on the drive in, we were surprised to see the Reyes Campground at the TH filled to capacity. The TH itself had only a few cars, those left by a handful of backpacking parties we would find along the way. The Jeep was hardly necessary to reach it, any vehicle would do, but it gave us a chance to drive in relative luxury compared to his previous Jeep. It was after 8:30a by the time we started on the Gene Marshall-Piedra Blanca National Scenic Trail (really, does the official name have to be that long?). Tom had brought one of his canine companions, Loki, along to join us on the hike. The weather was quite fine for most of the day, never really too warm nor too cold. A few early season flies managed to annoy us some while taking short breaks, but for the most part left us alone for the greater part of the hike. None of us had looked at the topo map very closely before we started out. We had assumed the trail follows the major drainage up for some five miles before cross-country travel would lead us steeply up to the summit. In reality, the trail travels through three separate drainages, requiring us to gain and lose unexpected elevation twice in each direction, adding significantly to the day's total of some 3,500ft of gain. At the top of the first saddle we took a side trip to visit Peak 5,180ft, an easy bonus peak on our way to Beartrap Bluff. Hunter/game trails up the connecting ridgeline from the saddle made the bushwhacking minor, the only real obstacle being the bountiful yucca that populate the hillsides in the area. The summit of Peak 5,180ft, turned out to be a bit of a bust, trees blocking much of the view and any actual highpoint difficult to pinpoint. Luckily it was only a short diversion and we were soon back on the trail. We followed it down to the Upper Reyes campsite where we found two parties milling about their tents, not yet ready to tear down camp to get moving. We then crossed Reyes Creek and began the numerous switchbacks leading up to the second saddle. Tom and I were moving slower than Patrick, who seemed to have an excess of energy, and we found him waiting for us in the open air of the saddle. He was snacking of course, to no great surprise to Tom and I - where others see a rest as a time to contemplate the surrounding beauty of the natural scenery, Patrick complements this with a continuous caloric intake in the same manner anyone else would draw a deep breath. Less than 15min later we were down at the Beartrap campsite where we stopped to water Loki, Patrick wasting no time in resuming his snacking ritual. Two and half hours into the outing, it was time to leave the trail and start the steep climb to Beartrap Bluff. We followed a use trail along the northeast side of Beartrap Creek downstream for only a short distance (maybe 1/10th mile) before finding the prominent gully leading up. The gully shows evidence of recent flooding but for the most part was in stable condition and made for an interesting ascent - not the scrambling one finds in Red Rocks, but pretty good nonetheless. There are options to do some slab climbing which we used to mix it up a bit, but for the most part we stuck to the gully where we found it shadier (much preferred by Loki). Ducks can be found leading up the gully for most of the route, though not really necessary. 2/3 of the way up the gully we came across an older couple scrambling the route at a slightly slower pace. They asked if we were "doing the Hundred Peaks list" to which I replied with a laugh, "who else would come up here?" After about 30min we emerged onto gentler, though more confusing terrain. It's not immediately obvious where the highpoint is among a jumble of large sandstone outcrops and brush can be a problem if one gets off-route. Careful attention to following the ducked route can alleviate any route-finding issues as they lead one to the south side of the large summit block, an easy class 2-3 affair from that side. It was a bit breezy and chilly atop the highpoint which affords a fine view in all directions, particularly to the north overlooking the lower canyons and hills between Beartrap Bluff and the much higher Cerro Noroeste and Mt. Pinos. A register found in a plastic tube was found to be completely waterlogged and unreadable. Two small holes drilled in one end of the container looked to be responsible. Perhaps they were intended to allow the container to "breath"? Patrick left a fresh piece of paper with our names on it, but I don't hold out much hope for its survival any better than the small notepad. Following this brief aside, Patrick resumed his feeding routine. "Olives anyone? Got 'em on Amazon!"